"The UAE and China have agreed to enhance cooperation in all fields to higher levels and forge overall strategic partnerships," the official WAM news agency said. It said this would "contribute to cementing and intensifying cooperation, boost joint development and prosperity, which is consistent with the common interest of both countries and their peoples". [post_ads]China and the UAE had already signed on Friday a raft of economic agreements and in the run-up to Xi's visit they agreed oil and trade deals. 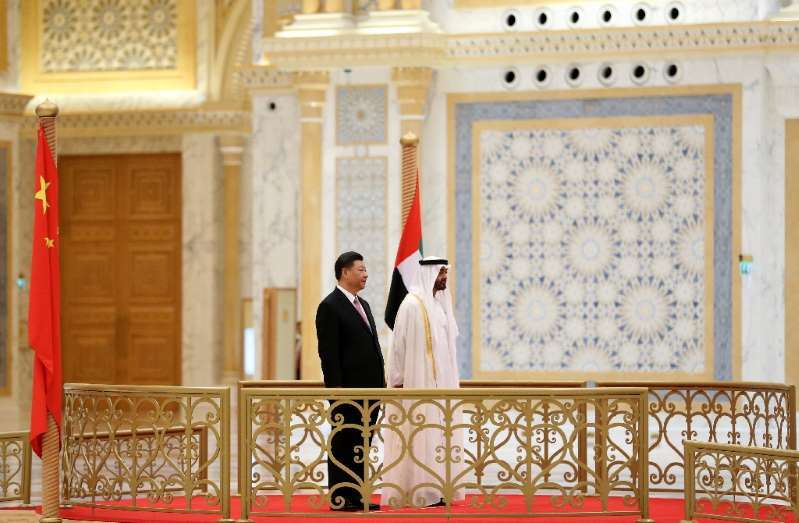 Xi met UAE Vice President Sheikh Mohammed bin Rashid al-Maktoum, who is also ruler of Dubai, and Abu Dhabi's Crown Prince Sheikh Mohammed bin Zayed Al-Nahyan during his visit. Abu Dhabi was the Chinese president's first stop on a tour which now takes him to Senegal, Rwanda and South Africa. There would also be joint military training, the two countries agreed. The United Arab Emirates was "keen to deepen cooperation" which China's "One Belt, One Road" infrastructure plan, the statement added. On Thursday, the UAE's state-owned DP World announced an agreement between the two countries to build a new trade zone in Dubai as part of that project. A strategic cooperation framework between state-owned Abu Dhabi National Oil Co (ADNOC) and China National Petroleum Company was among the deals signed on Friday, the UAE company said. On Thursday ADNOC announced it had awarded two contracts worth $1.6 billion (1.4 billion euros) to BGP Inc, a subsidiary of CNPC, for a seismic survey in the emirate. The survey will search for oil and gas in onshore and offshore sites covering an area of 53,000 square kilometres (20,500 square miles). China is the United Arab Emirates' top trading partner and the UAE is also one of the top 15 crude suppliers to China.